J-15 fighters from China conduct a drill in the area of South China Sea in January 2017. Chinese warships have been holding military combat drills in waters near Taiwan for more than a week, Beijing state media said on Tuesday. The news comes amid rising cross-strait tensions and invasion fears. Since June 17, a group of navy warships, including a Type 054A frigate and a Type 052C destroyer, have been conducting exercises near Taiwan, including in the Bashi Channel and the Taiwan Strait. That's according to 81.cn, an official publication of the Chinese army. “The drills tested the military and training abilities of warship, aviation and coastal defense troops, via organizing real combat training in multiple areas of the ocean,” it said. Although it is unclear whether the drills have finished, Taiwan’s defense ministry said in a statement that the vessels were monitored continuously and there was no cause for alarm. The purpose of Mattis’ trip is reportedly to improve security dialogue with Beijing. It is unclear whether Mattis will discuss the tense situation in Taiwan with Chinese officials. In recent months, China’s air force has held military maneuvers near the island, which Taipei has denounced as intimidation. In 2017, the People’s Liberation Army carried out 16 drills near the island. Although the mainland claimed the military exercises were routine, they said that any attempts to declare independence will not be tolerated. 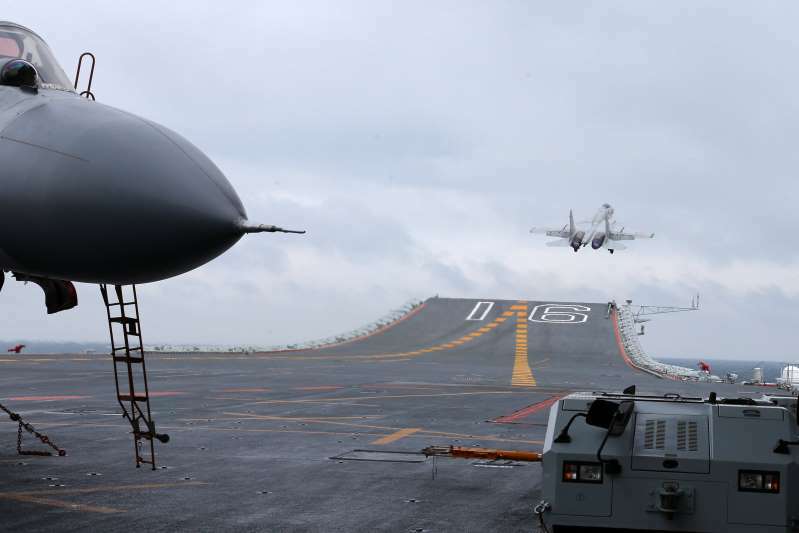 Last month, Chinese bombers encircled the self-governed island as part of another military drill. Taiwan sent fighter jets to shadow the bombers. “We are fully monitoring the situation and taking efficient responsive measures to ensure defense security,” Taiwan’s Defense Ministry said, adding that people should not be alarmed. China claims Taiwan as its own and has never renounced the use of force to bring under its control what it sees as a wayward province. Taiwan has shown no interest in being governed by the ruling Communist Party in Beijing. U.S. overtures towards Taiwan, from unveiling a new de facto embassy to passing the Taiwan Travel Act, which encourages U.S. officials to visit, have further escalated tension between Beijing and Taipei. Sino-U.S. ties are under growing pressure over burgeoning trade friction, the North Korean nuclear crisis and escalating activity in the disputed waterway of the South China Sea. China often says the U.S. acknowledgement of its “one-China” policy is foundational for two-way ties, and that Taiwan is the most sensitive issue in the relationship. The U.S. is considering sending a warship through the Taiwan Strait, officials said in early June. Such a passage, should it happen, could be seen in Taiwan as a fresh sign of support from President Donald Trump. The last time a U.S. aircraft carrier transited the Taiwan Strait was in 2007, during the administration of George W. Bush, and some U.S. military officials believe a carrier transit is overdue. China’s hostility toward Taiwan has grown since Tsai Ing-wen from the pro-independence Democratic Progressive Party won presidential elections on the island in 2016.